The Bathurst Buy Local Campaign is now running & Pressed Tin Panels are a part of it! The Gift Cards are an EFTPOS based system aimed at keeping money within the local Bathurst community. 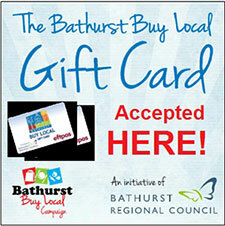 It works like any other gift card or voucher based system, the only difference is that the money can only be spent in Bathurst at participating stores. Gift cards are available from Load Up Stores locally. The purchaser of the card decides how much money to load onto the card and then this money can be spent by the cardholder to purchase goods in participating stores within Bathurst.